You’ve heard of these since you were a child but I’ve never actually read them myself from cover to cover or met anyone who has. Having done so now, I know why. They aren’t half boring. Sure, they’re cram full of wisdom but any genre starts to pale when you read 203 examples of it. There are some classics in there of course and some that should be more well-known but all in all, the way life is, it isn’t reading these that will make us wise in the end. The only way we’re really going to be one step ahead of our stupid selves is by simply growing old and making mistakes. 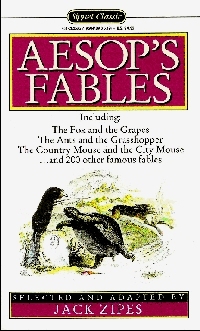 I have to teach fables to my year 5 children, after a while they can become a bit boring I agree! Boring sometimes but it is worth a treasure. The morals are not so deep to understand so am sure children will get inspired reading or hearing Aesop’s fables. All virtues and wisdoms we get will always apply no matter what age we live in. It reminds you of what being human is all about, the bad and the good.